Sammy Lees Motors are delighted to welcome into stock as the result of a local part exchange this ONE owner 2016 Audi Q3 2.0L TDI Quattro S Line Plus with 148 BHP. Finished in the stunning Hainan Blue Metallic which is perfectly complimented by a luxurious half Black Nappa Leather & Alcantara Cloth S Line embossed upholstery including heated front seats & upgraded 19" 5 double spoke alloy wheels. 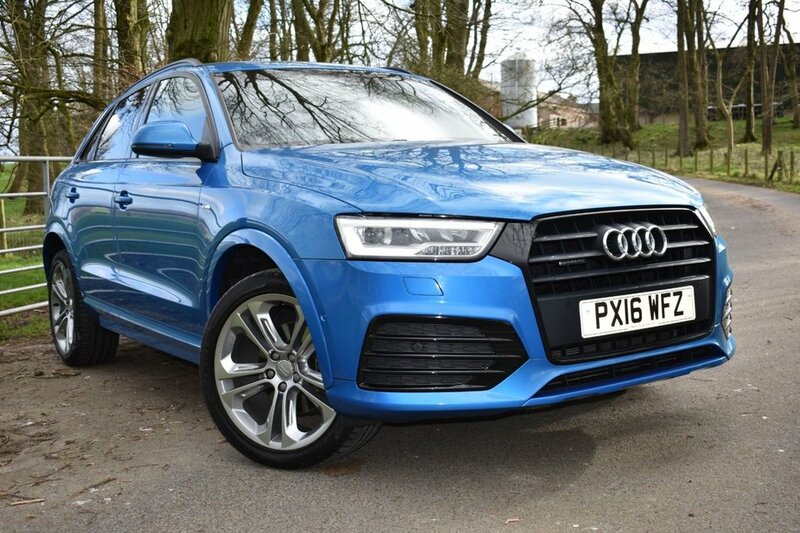 The Audi Q3 is a practical, well-built and desirable crossover. Its premium feel runs more than skin deep, as the compact Audi 4x4 offers an engaging, fun driving experience and genuine refinement thanks to solid design and engineering. Impeccable Audi build quality is reflected in a cabin that has a truly premium feel, too. This vehicle benefits from a full detailed service history having been serviced at 18,715 miles on 4.2.17, 28,216 miles on 7.9.17, 39,586 miles on 1.3.18, 47,845 miles on 29.8.18 & will come fully serviced with 12 months MOT as well as 1 years full FREE in house warranty - offering complete peace of mind. This immaculate & high specification vehicle comes with: - * Colour Reversing Camera, * Sat Nav, * Cruise Control, * Bluetooth Connectivity, * DAB Radio, * Dual Zone Climate Control, * Drive Select, * Parking Sensors/Parking Aid, * Electronic Tailgate, * Rear Privacy Glass, * Dual Chrome Exhaust, * Electronic Hand Brake, * Automatic Headlights, * Leather Multi Functional Steering Wheel. * ISOFIX, * 2 Remote Control Key Fobs, * Audi Hand Book Pack + Much More! Buy With Complete Peace Of Mind With Sammy Lees Motors Ltd As We Are A Independent Family Run Business With Family Values Ensuring That We Provide First Class Customer Service. We Welcome Part Exchange And Are More Then Happy To Advise In Regard To The Best Possible Finance Options Available. Find Us Situated Just Off The A66 In Appleby In Westmorland - Postcode CA16 6HX. Viewing Can Be Arranged 7 Days A Week Anytime Day Or Night By Calling On 017683 53238 Or 07841 135262.